Golden Delicious × Lady Williams, John Cripps 1973, Stoneville Research Station, Western Australia. Strong upright growth with wide branch angles, but spurs up well. Not susceptible to mildew, but is susceptible to magnesium deficiency. Early, 7–10 days earlier than Cripps Pink, and longer period. Medium conical to squarish, globose-oblate. 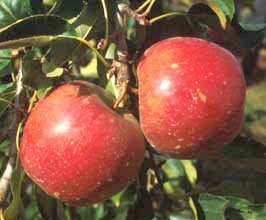 Red with characteristic white lenticel spots, smooth, russet around stalk and open deep-set eye. Not prone to sunburn, russet, surface cracking, bitter pit or internal disorders and scald. Crisp and juicy flesh, sweeter than Lady Williams but not as sweet as Golden Delicious; coarser than Cripps Pink. Late May to early June, 3 weeks after Cripps Pink but a few weeks before Lady Williams. May tend to biennial bearing. Long; longer than Cripps Pink, with a good shelf life. Note: Cripps Red apples of an appropriate quality may be sold using the trademarked brand name SundownerTM.